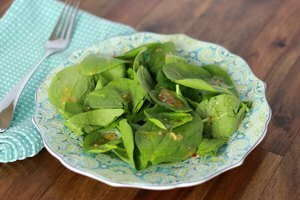 Spinach, whether fully mature leaves or the tiny tender leaves of baby spinach, cooks quickly, making it ideal for steaming. 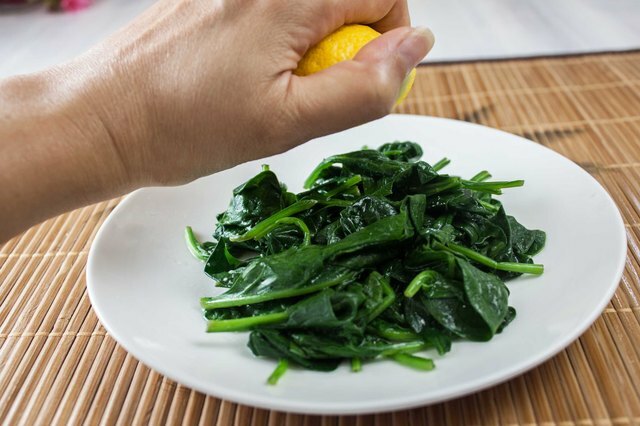 Steaming in the microwave is, like steaming on the stove, a moist-heat cooking method that preserves all the nutrients of spinach. It is also a low-fat cooking method. 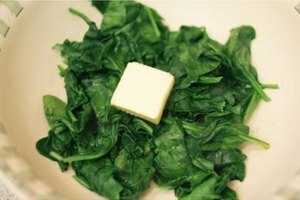 You can steam spinach in the microwave using a microwave-safe dish, a microwave steamer or, in a pinch, a food-grade plastic bag. The younger the spinach, the more flexible the stem is. Because cooking softens the tough fibers in vegetables, you do not need to select only young, tender leaves. 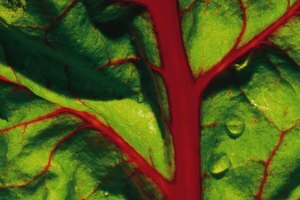 Look for bright green leaves that have no bruising or dark or yellow areas. 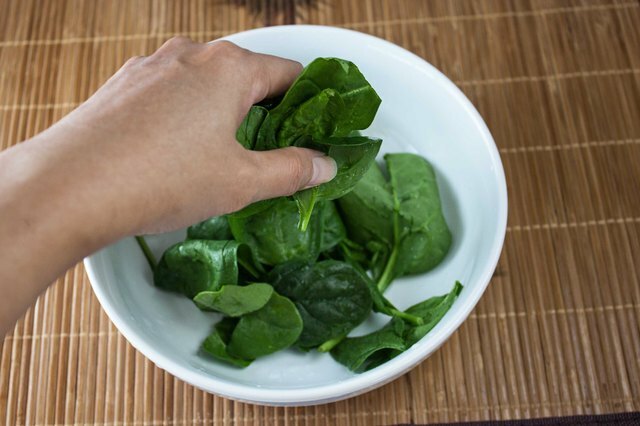 Clean spinach by soaking and swishing in a bowl of cold water to loosen any dirt clinging to the leaves. Repeat with fresh water until the leaves are squeaky clean and there is no debris at the bottom of the soaking bowl. If the stems are very tough, cut them off. 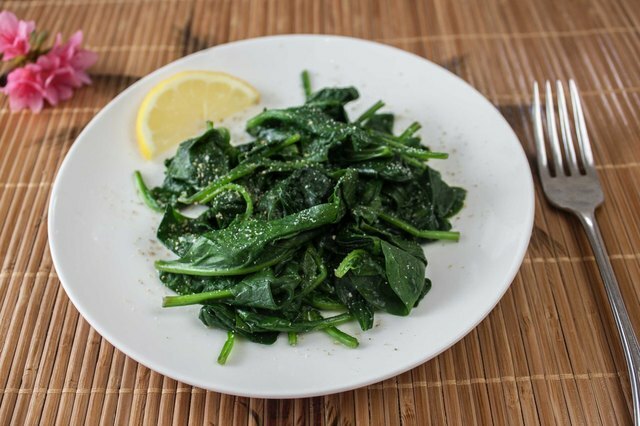 To steam spinach in the microwave, place the leaves in a microwave-safe bowl while they are still wet. If the leaves are still wet, there is no need for additional water. Cover with with a microwave-safe lid or a piece of plastic wrap. Leave one corner of the plastic wrap open to allow moisture to escape during cooking. Microwave on high until all the leaves have turned dark green and are fully wilted. 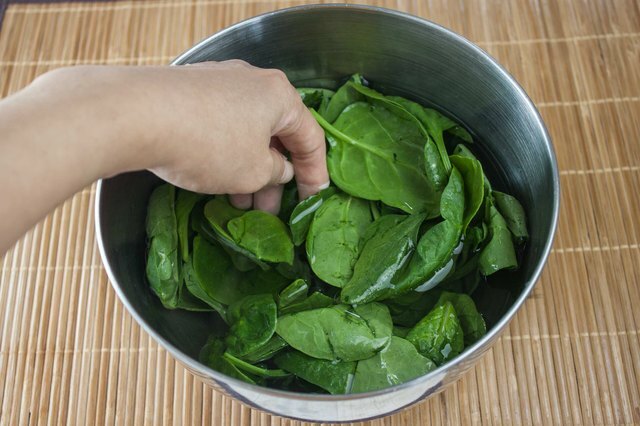 It will take roughly 3 minutes to steam a 1/2 pound of medium-sized spinach leaves. You can also steam spinach in a microwave steamer. A steamer allows you to season the steaming liquid, so that the scent and flavor clings lightly to the cooked leaves. Fill the bottom part of the steamer with stock, wine or water and seasonings, such as garlic cloves. Steam the spinach, covered with the vented lid, for 3 minutes on high for a 1/2 pound of spinach. 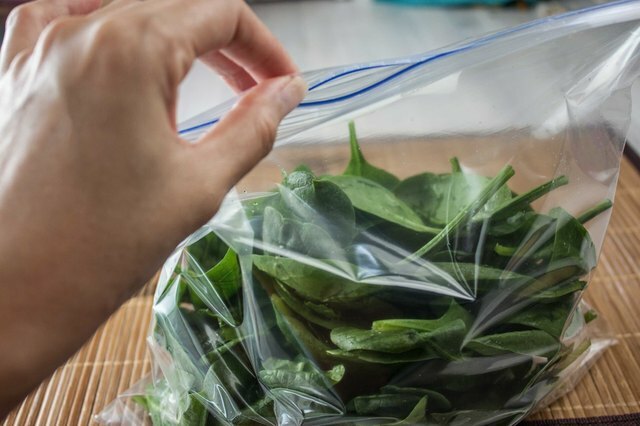 Spinach can also be steamed in a plastic bag, so long as it can be partially sealed. Because the seal in a plastic bag is much tighter, it will take less time to cook. Microwave on high for about 2 minutes. As is the case with the basic steaming method, keep your leaves moist or sprinkle a few drops of water into the bag before cooking. Steamed spinach has a mild, vegetal taste, even if you did season the steaming liquid. Because of this, it can be dressed with lemon juice, salt and pepper for a low-fat side dish, or it can be mixed with melted butter for something more decadent. A classic use of steamed spinach is to mix with soy sauce, toasted sesame seeds, sesame seed oil and steamed tofu for a light, healthy Japanese dish. For something fast yet satisfying, crumble feta onto the hot spinach and stir, letting the heat of the leaves melt the cheese, and serve on toast. 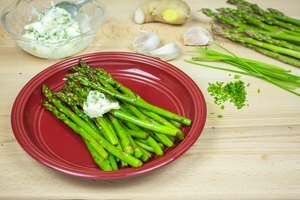 What Spices Go Best With Asparagus?